Eddie informed me that he was going to ask a girl to the homecoming dance. He isn't dating anyone (never has, which is fine with Coach and I - plenty of time for that) and for the most part he is content to hang out with his buddies. They shoot hoops, or get ice cream, or attend the high school football games, or eat at a local burrito place, or gather at someone's house for a bonfire. 1. He values time with his buddies, but his commitment to sports teams and his academics comes first (not necessarily in that order). 2. The guys he considers hilarious are his faves. 3. He manages to avoid inviting anyone to our house. EVER. At the moment he has an excuse, because our house is under construction. Our basement is our main living space - complete with a small functioning kitchen and a couch, a TV and a bathroom. Typically the teenagers and their friends would gravitate towards our basement. Not the case when the rest of the fam is hanging down there. 4. Ed likes to pretend that he doesn't have siblings and possibly even parents. So our presence in a shared space with he and his friends would wreak havoc on his Oliver Twist-ish mindset. 5. My junior in high school has zero interest in girl drama or in girls that create girl drama or in girls that live for girl drama. He can't be bothered. 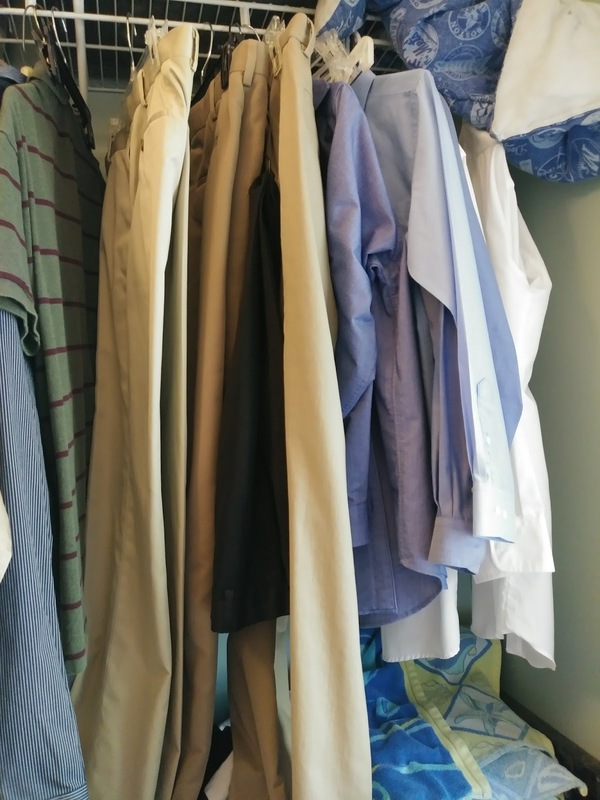 A spot in my laundry room where dress clothes gather. 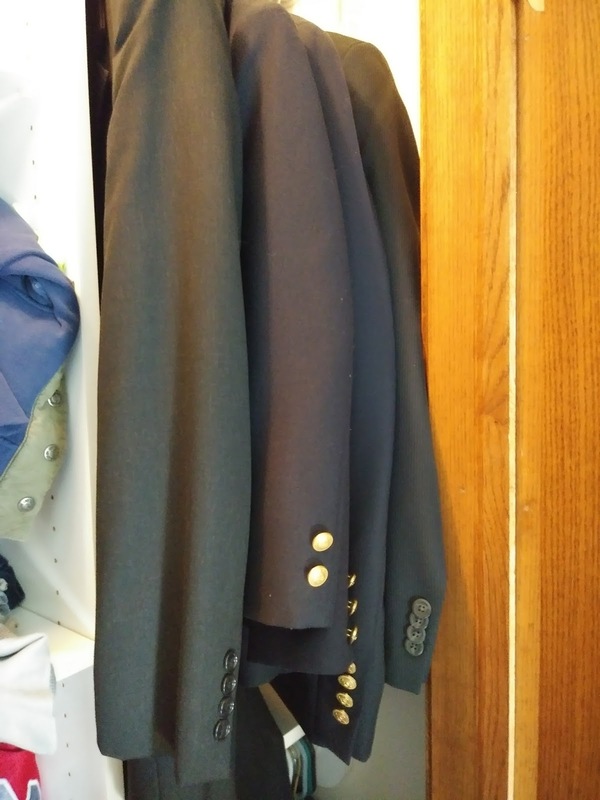 Honestly, at the rate at which my boys grow combined with the rate at which my sister drops off unwanted sport coats from her much shorter but older kid, my dress clothes overflow could supply Reggie with a fabulous business work wardrobe should he chose to drop out of 6th grade and become a professional. I suppose given his interest in sports, he'd be best equipped to broadcast sporting events. My point - most of this stuff doesn't fit my three oldest boys. Knowing that I would be out of town the weekend of homecoming, I made a point to have Ed try on dress clothes a few weeks in advance. I was hoping that something we owned would work. 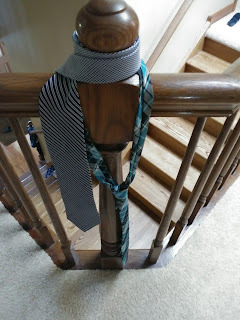 Tank expressed an interest in attending the dance as well, so while I searched for clothes for Ed, I ordered him to grab any dress pants that fit him last year from his closet. A few stray ties still hang on the banister where Ed tried on clothes. He so prefers to pretend he doesn't live with any of us, we aren't typically welcome in his room. Our trying on suits and such was conducted in the hallway. In an amazing the-stars-have-aligned moment Laddie's gray high school graduation suit fit Ed perfectly. Ed is 6' 3". When Lad graduated in May of '16, he was probably around 6' 2" but the suit pants were a tad long on him. Lad was more filled out as a senior so the jacket on Eddie had a bit of room, but my son wasn't appearing in GQ. He was just attending a dance. Tank, who is now a little over 6 feet tall as a 14 year old stomping around in size 15 steppers, fit into a number of Ed's old dress pants. Awesome. Tank planned to attend the dance. Most freshman at their school just go to the dance in a group. They gather at a previously arranged home where a crowd of parents take loads of pictures. Then the freshman head to the dance in a bunch of available minivans. Aha! More sport coats in Tank's closet. Ed wasn't sure who he was going to ask to the dance. I inquired a few times without being pushy. I really didn't care who he asked. Perhaps my children will one day thank me for not possessing the 'match-making' gene that is so prevalent from my mother's genetic pool. I assumed he wasn't motivated by some romantic inclination. At one point Ed said to me, 'I don't know. Any girl I ask will say yes.' That comment caught my attention and made me almost barf. Ed noticed my expression, my sharply inhaled breath, and my hands clenched in tight fists. He quickly explained himself. He was kind of waiting to see who still needed a date. He said the girls all wanted to go with a date. The guys didn't really care. So his comment really meant: 'I'm just going to take a date because I know the girls want to go with a date.' He wasn't trying to sound conceited, so I let him live to see another day. He figured he would just ask a girl who hung out in his group of friends. There was a senior girl he thought of asking, but he figured she'd rather go with someone from her circle. He continued to weigh his options and wait. I suggested that he do his homecoming homework and find out if these girls did indeed already have a date. He looked at me like I was insane. Duh. That is already factored into the equation. I believe he asked if I was stupid. I think the correct label for my flubbed date request of the late '80's stemmed more from inexperience than stupidity - that's my story and I'm sticking to it. Don't make me go into it again . . . just read about it here. Labels: avoiding girl drama, date, family embarrassment, sport coat anyone?, who to ask?